Taking into account a recession reached by a sensor industry due to modern crisis, the IFSA is going to support the sensor industry in this hard time. It means prices reductions for ads services at primary Internet recourse - Sensors Web Portal (http://www.sensorsportal.com). The new Media Kit 2010 is available for download online. New services include press releases and white papers publication. 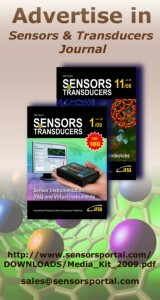 IFSA members and advertising agencies have 10 % discount for all Sensors Web Portal services. The deadline for articles, press releases and sponsored White Papers for the next issue of S&T Journal (e-Digest) No.11, Vol.110, November 2009 is 16 November 2009. You can submit your article or press release online. For more information and instructions of preparation click <here>. Recently Opened Job Positions at PCB Piezotronics, Inc.
1) Acoustics Engineer. PCB has a 40+ year history of growth and innovation and we are one of the world’s pioneers in the field of vibration measurement. We have built a global $100 million dollar annual business that focuses on Total Customer Satisfaction and world-class product quality. Within the last 10 years we have taken calculated steps to expand our market reach into the important and growing field of acoustic measurement, including the acquisition of Larson Davis, a well-established acoustic products supplier, and the launch of a new pre-polarized condenser microphone line. Our goal is to establish our position as the premier microphone supplier in the world. An Acoustics Engineer is well-versed in condenser microphone design and manufacturing. They use their engineering education, background knowledge and experience to take a leadership role in the initiation, scheduling, and execution of product design projects in order to launch into a manufacturing environment. They work with other Engineers, Supervisors, Planners, Buyers, Manufacturing Technicians, and Sales Representatives in order to learn, improve, and teach new technology, manufacturing processes, test methods, departmental procedures and policies. In addition, they utilize significant understanding of PCB’s business model, market position, quality and cost goals to not only improve new designs, but to work with other functions to improve internal processes. Further, they create the documentation package to provide the “recipe” for the manufacturing our products. 5 plus years experience in precision condenser microphone design. 5 plus years experience in diagnosing and solving manufacturing process issues associated with condenser microphone manufacturing (pre-polarized especially). Significant experience communicating and working with acoustic application engineers and customers. Significant and deep understanding of the principles of operation of condenser microphones; other types of microphone or acoustic measurement experience a plus. Must have ability to apply tools of Lean Manufacturing, Six Sigma, SPC’s, Design of Experiments, Error-Proofing, and Shainin techniques. 2) Senior Vibration Sensor Design Engineer. PCB has a 40+ year history of growth and innovation and we are one of the world’s pioneers in the field of vibration measurement. We have built a global $100 million dollar annual business that focuses on Total Customer Satisfaction and world-class product quality. A Senior Vibration Sensor Design Engineer is well-versed in high temperature accelerometer design and manufacturing. They use their engineering education, background knowledge and experience to take a leadership role in the initiation, scheduling, and execution of product design projects in order to launch into a manufacturing environment. They work with other Engineers, Supervisors, Planners, Buyers, Manufacturing Technicians, and Sales Representatives in order to learn, improve, and teach new technology, manufacturing processes, test methods, departmental procedures and policies. In addition, they utilize significant understanding of PCB’s business model, market position, quality and cost goals to not only improve new designs, but to work with other functions to improve internal processes. Further, they create the documentation package to provide the “recipe” for the manufacturing our products. 5 plus years experience in high temperature accelerometer design. 5 plus years experience in diagnosing and solving manufacturing process issues associated with manufacturing high temperature accelerometers. Significant experience communicating and working with high temperature application engineers and customers. Significant and deep understanding of the principles of piezoelectronics. Experience with government and/or aerospace contracts. 3) Greater China Sales Manager. Develop annual sales and marketing plans and provides regular feedback on performance. Prepares monthly report to HQ and provides closed loop management system of leads and quotations. Ensure effective communication between China staff and HQ. Lead the team to achieve the goals of the plan. Recruit, train and manage staff. Travel throughout the region to customers, distributors and direct employees. Coordinate and deliver seminars, make customer visits and ensure factory support. Develop a concept of customers needs by studying company operations and reviewing its stated needs. During visits to customer sites, advise customer on use and maintenance of products. Assist the Divisions in developing or recommending new applications or improvements of products and assists in the pricing of customized products. Manage distributors/customer visits to HQ. Manage equipment for tradeshows and arranges for its shipment, as required. Manage communications of pricing, product and policy updates from Divisions to employees, distributors, and customers. PCB Piezotronics, Inc. is a privately owned, high-technology company specializing in the development, production, marketing and sale of piezoelectric, capacitive, silicon and resistive-based instrumentation for measuring pressure, force, torque, load, shock, sound and vibration. These sensors and associated hardware are used for a wide variety of industrial, research, university, aerospace and military applications, ranging from the characterization of underwater blast wave propagation to monitoring micro-g vibrations on the solar panels of orbiting satellites. In essence, any structure that vibrates, pulsates, moves, compresses, surges or makes noise has the potential to be monitored by this instrumentation. We are a dynamic company that is committed to employee training and development, as well as having a world-class compensation and employee benefits package. For more information on our company please visit our website at www.pcb.com. Interested and qualified candidates are encouraged to forward their resume to jobs@pcb.com for immediate consideration. Based on a complete reverse engineering process the report provides an estimation of the production cost as well as the selling price of the circuit. The IDG-1004 is an integrated dual-axis angular rate sensor (gyroscope). It uses specific InvenSense’s technology with three bonded wafers. The MEMS are manufactured in a thin wafer bonded on an integrated circuit. The sensor is protected by a CAP which allows the MEMS to be integrated in a standard package. All electronics are integrated onto the IC. System Plus Consulting is proud to publish the reverse costing report of the MEMS Microphone SPM0408HE5H supplied by Knowles Acoustics. Mostly used in cell phones, the Knowles MEMS microphones have been shipped at more than 1 billion units since their introduction. They use a specific surface mount designed FR4 type package, containing 2 separate dies: a capacitive MEMS microphone and an ASIC for signal amplification. Since the last generation, several changes have been realized like the use of Deep Reactive Ion Etching for the MEMS cavity instead of traditional KOH etching.